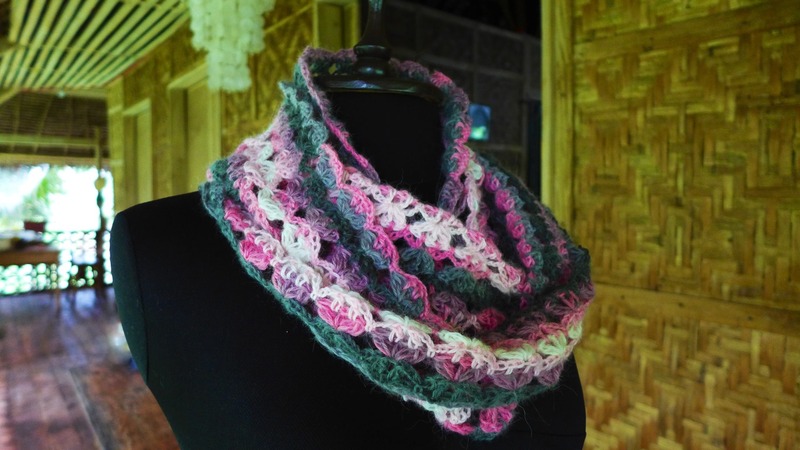 "Loopy" is a neckwarmer that's made as a loop, a scarf with no ends. It can be made skinny or wide. 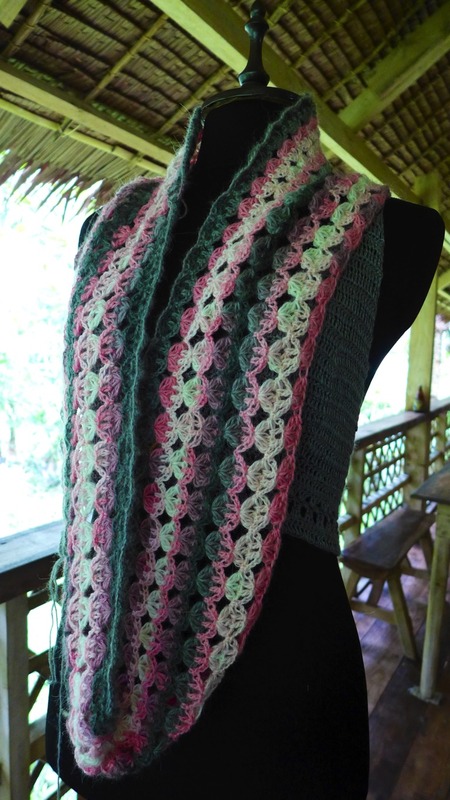 It can be worn looped or unwrapped, or maybe even as a shawl or capelet if it was the right size. Make one for yourself or to give to family and friends this Christmas! Design notes: Start with chains of at least 72 inches in length for a large scarf that can be worn doubled. Mine is 300 chains. 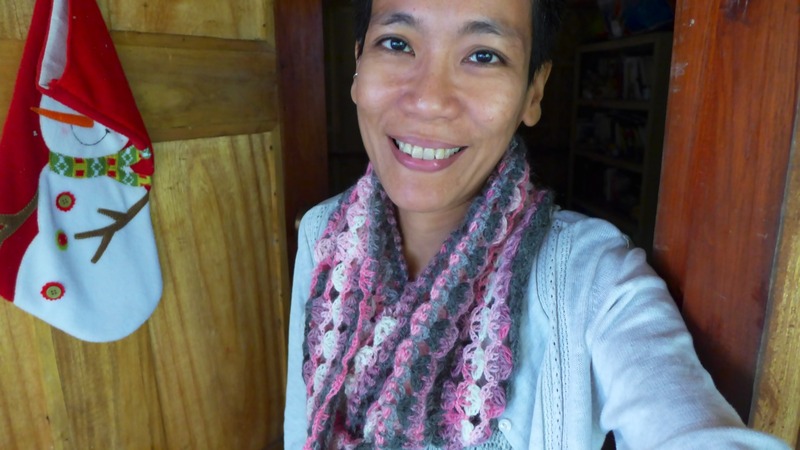 Make a shorter chain to make a smaller scarf. Pattern stitch is in multiples of 6 stitches. 16 rounds make a scarf at least 7" tall. Add more rounds for taller scarf. I'm anxious of making a long chain then joining them without twisting. So this scarf is made by joining only after the first round where there's much less chance of twisting. But you can deliberately twist once to make a moebius scarf. 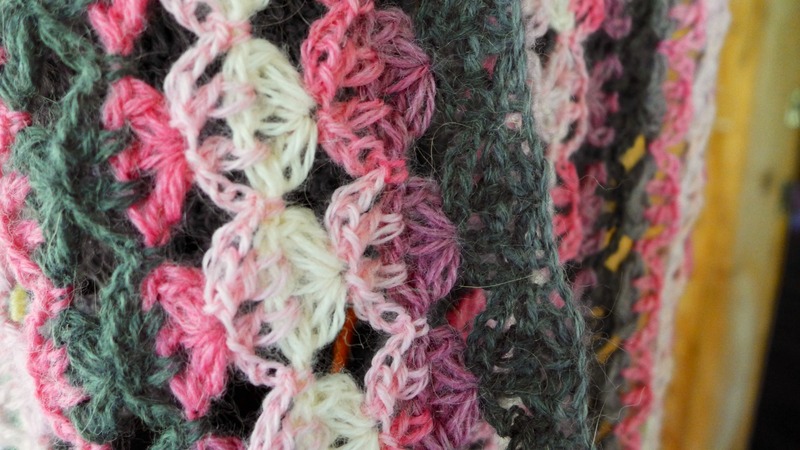 Use multi-colour / self-striping yarn that has long strands of colour. This makes for the best alternating stripes of colour in the pattern. Substitute yarn and suitable hook freely, aiming for good wool or wool blends for warmth, stretch, softness. Double crochet two together (Dc2tog): [Yarn over, insert hook in stitch, yarn over and pull up loop, yarn over, draw through 2 loops] 2 times, yarn over, draw through all loops on hook. Rnd 1: In fourth ch fr hook make (dc, ch 1, dc, ch 1, dc); sk 2 ch, sc in next ch; *sk 2 ch, in next ch make (dc, ch 1, dc, ch 1, dc); sk 2 ch, sc in next ch; rep fr * all across, ending with sc in both last and first ch to join. (50 half-shells made). Rnd 3: Sl st in each of next 3 ch, sl st in dc, sl st in 1-ch (work in the ch and not in the ch-sp); ch 3, in same 1-ch make (dc, ch 1, dc, ch 1, dc2tog); *in next 1-ch make (dc, ch 1, dc, ch 1, dc2tog); rep fr * all around, ending with sl st in top of first 3-ch to join. Rnd 4: Ch 1, sc in sp between first and last half-shells made in previous round; ch 3, dc in first ch-sp of first shell, ch 1, dc in next ch-sp of same shell; ch 3, sc in sp between first and second shell; *ch 3, dc in first ch-sp of next shell, ch 1, dc in next ch-sp of same shell, ch 3, sc in sp between this and next shell; rep fr * all around, ending with sl st in first sc to join. Rnd 5-16. Repeat Rnds 3-4. Fasten off. Weave in all ends. Thank you for finding the error! I have been trying to figure it out since yesterday! I've made the corrections in bold letters. If you find any other errors or confusing parts in the pattern, please let me know. I most appreciate it!